Most of you know that I, Cinnamon, test out products and write about my experiences. And, you know, I do get paid for those posts and disclose that. I buy food, toys and vet visits with those checks and appreciate getting to test products very much! But today, what I am telling you is from my heart... not from my pocketbook. No one asked that I talk to you about Chewy.com. I just decided I have to tell you about their customer service and great packages I receive right on my front porch... in record time. This all started when my owner got a huge coupon from Chewy.com in the mail. She looked at the savings and thought it was worth trying. So when she ordered she got the coupon discount, another discount for putting our food on auto-ship and then got free 2 day shipping because the order was over a certain amount. So in effect, I got a 30 pound bag of my favorite food and two toys for less than $30. Amazing. 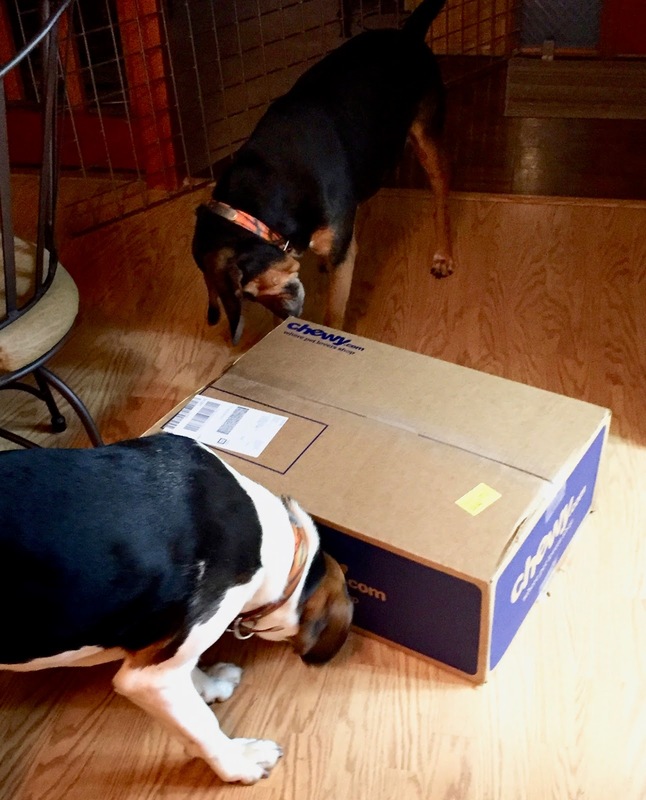 Here's Francesca trying to get into our Chewy's shipment. Back, Francesca, Back! So that was nice, but what we then found out is that real people answer the customer service line and, unlike many businesses, they actually provide service. 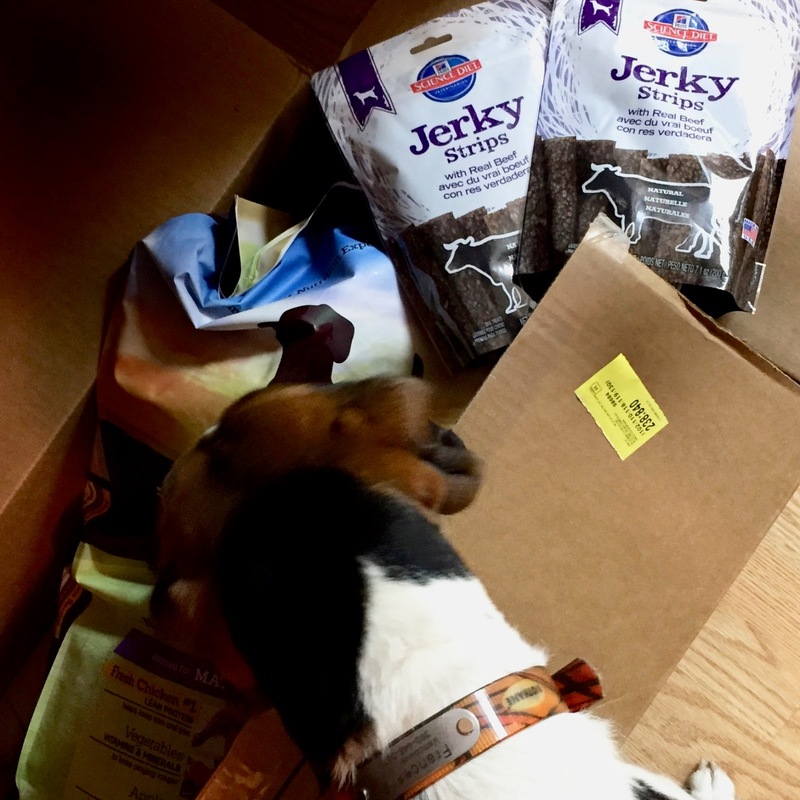 We had ordered Hill's Ideal Balance Natural Chicken and Brown Rice Recipe Dry Dog Food and two bags of my favorite treats, Hill's Science Diet Jerky Strips with Real Beef. But it wasn't coming soon enough. We were almost out of food. So the nice customer service people moved up our shipment. Since it was over $49 we got free 1 - 2 day shipping. So this time, our owner screwed up again. We were planning to go to the Doggie Country Club for a whole week and our food wasn't scheduled to be delivered until we had left. So we found out that you can change your ship date right online. And it works! In two days, at 4:30 p.m. exactly, there was a thud on my front porch. Francesca and I ran to the door with our tails wagging. Here's our big box. We're so excited! Our owner opened the door and there it was... a nice big box with the huge sack of food and two bags of treats. We were so excited! 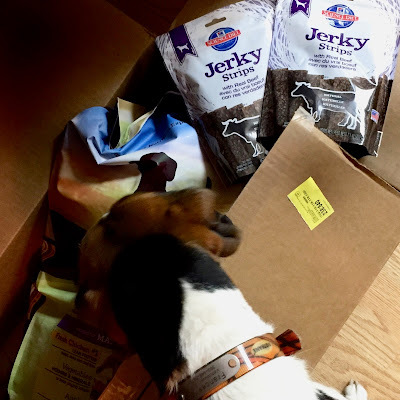 Chewy's has become our favorite online source because they have all kinds of products, deliver on time, deliver intact boxes with no damage and make things easy. Oh yes, the prices are amazing. I can't wait until next month to see what we get! Hi, it's me Francesca. Cinnamon is busy redesigning our room so I'm tasked with posting this update. Well, Thanksgiving was really rainy. We didn't get any turkey until this morning. It was better last year when our owner cooked and had turkey to give us during the day. It seemed like a special day that way. Oh well. So what am I thankful for? I am thankful for food in my tummy, A Dog's Best Friend Day Care, my Clark DogPaw Dog Parks, Running Pond Acres Boarding Country Club, toys (few as they are), Nylabones, Cinnamon and our owner who sometimes lets me on her bed. I won't go into what I am NOT thankful here. I'll save that rant for another time. So what did we do today. Well, we certainly didn't go shopping even though I have a long list of things I would like for Christmas. 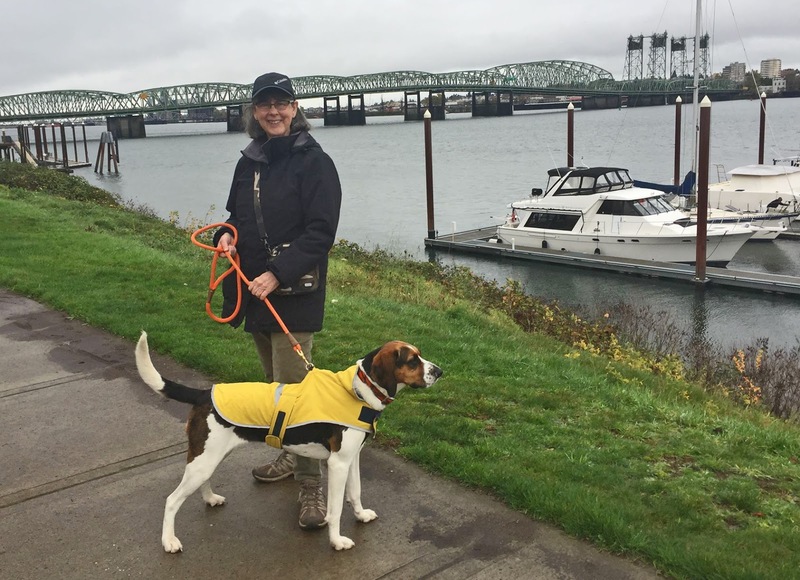 We joined REI and our friends for #Optoutside, a day outside enjoying nature. We decided to go walking with the Columbia River Walking Club and the Vancouver Volkssporters Walking Club over at Hayden Island. Here we are at the beginning of the walk. 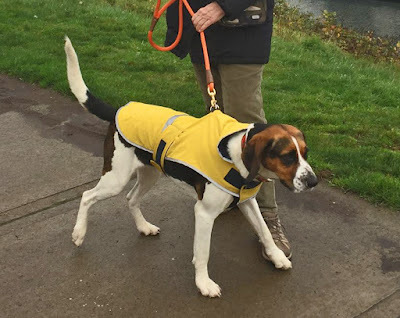 I had my raincoat on because we expected rain. It made me look like a service dog! We registered at the Red Lion Hotel. I checked out the lobby and was pretty impressed. I saw some friends but wasn't allowed to jump up to greet them. I just don't understand that at all! Best of all we got to walk with our friend Walking Wendy who took these pictures. That made my owner happy. The walk was pretty good. We enjoyed views of the Mighty Columbia River (as Cinnamon calls it), found some excellent squirrel trees and walked through a park where we could see house boats. Then it was over, way too fast. I guess I was misbehaving for a good part of the walk because squirrels were taunting me. Why do I get in trouble when it's the squirrels that are bratty! I just don't understand. Anyway, I got another 5K volksmarch for my list for 2016! Well, I was completely surprised when the mail arrived today. Two huge boxes were on the porch and they were for Francesca and ME! Gone are the times when I got to pick out my own dog bed. Gone are the times when I got to post a poll and take reader input on the color. When we need a bed, they just appear! So, I figured it was about time. Francesca had started tearing in to her bed. The cover was so thin she could see the foam underneath. They were big beds, but the top layer was thin. (You get what you pay for!). And she started digging at the foam. There were little pieces of foam all over the floor. Here's Francesca trying to get comfortable. Note the little piece of foam on the floor to the left. That's what she did to her old bed. So we opened the boxes. Inside were two pretty beds with Fair Isle printed covers. They were deeper than the old ones and cushier. But, oh dear, they were smaller. I think our owner is tired of our beds taking up over half of the office. It leads to lazy writing! I'm not sure this bed is big enough! So we are testing these smaller beds. They are good for coonie balls, but what if we want to stretch out? You don't suppose we'd have to sleep on the floor do you... on the rug? Stay tuned and I'll let you know if I can adjust. Francesca seems to have adjusted just fine. Check this out. Francesca can stretch out to about 5 feet tall on her hind legs. But she's managed to take only half the bed up when she gets in a coonie ball. I might be thankful this Thanksgiving. Or I might not!